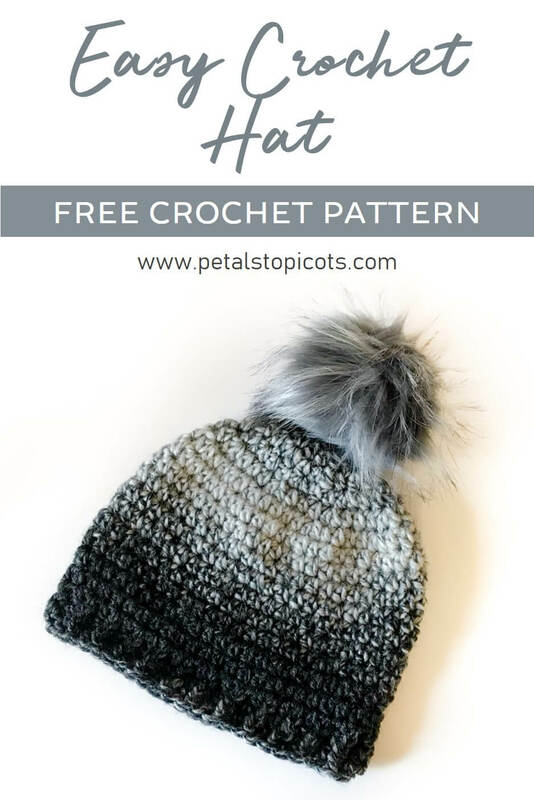 Home > Crochet > Free Crochet Patterns > Easy Crochet Hat Pattern … Great for Beginners! This is a super basic and easy crochet hat pattern. 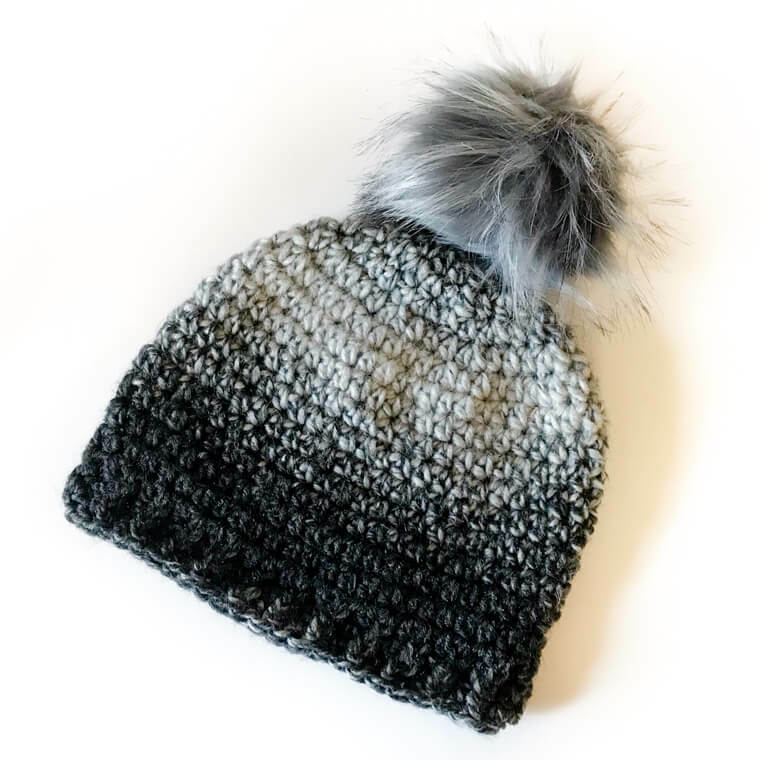 It works up quickly with a skein of bulky weight yarn and is a great hat pattern for beginners and more experienced crocheters alike. If you would prefer to use worsted weight yarn, I have another easy crochet hat pattern here that you can try. This pattern is written for a standard adult size but can be easily modified to fit any size with this handy Hat Sizing Guide. Notes: This hat is worked in unjoined rounds until the edging. Use a stitch marker to keep track of rounds. Gauge = 11 sts in 4 in. Round 1: Ch 1 (does not count as stitch), work 8 hdc in ring — 8 sts. Round 2: Work 1 hdc in next st, work 2 hdc in next st and each st around, join — 16 sts. Round 3: Work 1 hdc in next st , 1 hdc in next, *2 hdcc in next st, 1 hdc in next, rep from * around, join — 24 sts. Round 4: Ch 2, work 1 hdc in next st, 1 hdc in each of the next 2 stitches, *2 hdc in next st, 1 hdc in each of the next 2 sts, rep from * around, join — 32 sts. Round 5: Ch 2, work 1 hdc in next st, 1 hdc in each of the next 3 stitches, *2 hdc in next st, 1 hdc in each of the next 3 sts, rep from * around, join— 40 sts. Round 6: Ch 2, work 1 hdc in next st, 1 hdc in each of the next 4 stitches, *2 hdc in next st, 1 hdc in each of the next 4 sts, rep from * around, join — 48 sts. Remove marker and put aside. Sc in next st, sl st in next st to join. Continue on to Edging pattern. Round 17: Ch 1 (does not count as stitch), work 1 hdc in same st as join, 1 FPdc around post of next hdc, *1 hdc in next st, 1 FPdc around post of next st, rep from * around, join — 48 sts. Round 18: Ch 1, work 1 hdc in same st as join, 1 FPdc around post of next FPdc, *1 hdc in next st, 1 FPdc around post of next FPdc, rep from * around, join — 48 sts. This pattern came in a very timely fashion! I have some bulky yarn that I was requested to make a hat out of. I have a question though because the pattern says it’s worked in unjoined rounds but in each round at says to work a double crochet in the same stitch as the join so I’m just a little confused. Please advise? Thanks! Hi Sharlyn 🙂 You are correct … that was a cut and paste error on my part. I did work this in unjoined rounds. I have corrected the pattern to reflect that. Thanks for pointing that out!! !